:: Colorescience Event - Tuesday, April 11th! Spring is here. Can you believe it? Come and relax with a facial by Nicole that will consists of a skin analysis, facial cleansing with a Green Papaya Cleanser and Exfoliating Treatment, exfoliation with steam towels, décolleté, upper back, hand and foot massage, extractions if needed, and ending with a treatment mask. Experience this powerful antioxidant treatment that will help boost collagen, while hydrating, exfoliating, and softening skin. We will begin with a Lemon Chiffon Cleanser, exfoliate with a 100% natural Blueberry Wine Peel. Red Wine Concentrate with Noni for the massage will help repair and rejuvenate skin. Tone, tighten and firm your skin with the Chocolate Wasabi mask. Hydrate with the Red Wine, Blueberry and Pumpkin Age Defying Cream. Your skin will feel sensational! This is one of my favorite treatments. Be pampered for over an hour for only $75. 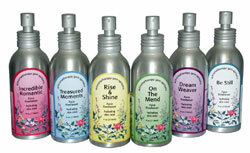 Product of the Month - Achromatherapy Gem Spritzers - talk about mood swings! Colorescience has combined aromatherapy, colore therapy and gem therapy, all in one easy application. Revitalize and set your mineral makeup, hydrate and nourish your skin, and enhance your mood with just a push of the button! Spritz, breathe and go! Gem Spritzers are $20 and Be Still (heavy water base) is $25. Purchase a Over the Moon Facial Gift Certificate during the month of April and receive $10 off any spritzer. These would go great in a basket for Administrative Assistant's Day or Mother's Day. Or if you just need something nice and unique or simply a little something extra for yourself. Colorescience Event - Tuesday, April 10th! Have you be wanting to experience Colorescience but have not made the time? Come see Kelley on Tues, April 10th from 5-7 for a complimentary colore matching and experience all that Colorescience has to offer. Easter Buffet includes: Carved Ham & Carved Lamb, Turkey & Dressing, Fried Chicken, Squash Casserole, Corn Nuggets & Fried Okra, Mac & Cheese, Sweet Potato Soufflé, Redskin Mashed Potatoes, Roasted Veggies w/ Artichoke Hearts, Fresh Fruit, Greek Salad, Caesar Salad, Deviled Eggs, Shrimp Salad, Spinach Salad, Cheesecake, Chocolate Cake, Carrot Cake, Banana Pudding, Strawberry Shortcake. Come celebrate your Easter Sunday with us and enjoy an unforgettable Culinary Extravaganza. Make your reservations early because space is limited. Menu: Italian Sausage & Sun-Dried Tomato Breakfast Omelet, Bacon & Sausage, Shrimp & Grits, Homemade Pancakes served with your favorite condiments, Crème Brulee French Toast, Beef Medallions served with a Bourbon Mushroom Cream Sauce, Tangerine Glazed Ham carved to order, Pork Tenderloin served with a Apple-Pear Chutney, Marinated Grilled Chicken served with a Raspberry Chipotle Sauce, Bohemian Vegetables, Smoked Gouda Mashed Potatoes, Pasta Salad, Broccoli Salad and Fresh Fruit Display. Back by popular demand, the chocolate fountain will have a new look surrounded by Lisa's delicious homemade desserts. Enjoy the Cafe's assorted beverages with your meal. If you have had some type of eye infection you should throw away any eye product that you have used, or you risk reinfection! Saturday, April 14th at Clemson. Saturday, April 28 at Caesar’s (McAlister Square). Dinner seating starts at 5:30 and performance starts at 7. Please call 864-233-4094 for reservations.